The Supreme 5 Star Award features a gold or silver premium plastic fanfare topper with five shooting stars. The Award stands on a black solid marble base, and can be personalised with engraving and an image or logo insert to make it suit any occasion. The Star Wreath Award is a two tone gold trophy. Set withing a metallic gold coloured resin frame is an antique gold wrath with star centre detail. the premium resin trophy then stands upon a rectangular base with space for personalisation. 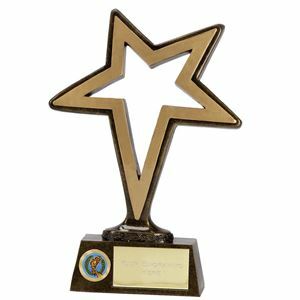 The Galaxy Gold Cast Metal Star Award is a premium quality gold metal award set on top of a square marble base. Available on 2 different sized bases, the cast metal star award features a gold star outline topper. 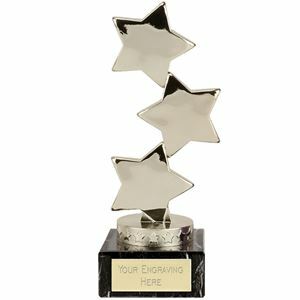 Made from high quality silver metal, the Galaxy Silver Cast Metal Star Award features a star outline trophy topper set on top of a choice of 2 marble bases. Displaying a set of three stars balancing on one another, the Hope Star Silver Award sits on a solid marble block which can be personalised. Made from a premium grade of plastic, the award has been coated in a high shine silver glaze to create an eye catching trophy. Also available in gold. Displaying an array of shooting stars, arranged as if busting from the base, this striking award would make an ideal award for a number of occasions. Cast from a durable plastic and coated in a glossy gold glaze, the stars are hollow whilst their tails are finished with a textured effect. The Fanfare Trophy may be personalised with a printed logo insert as well as bespoke engraving. The Apollo Silver Multi-Sport Trophy is made from a superior grade plastic and mounted on a small solid black marble base. The trophy has been lacquered in a silver glaze and finished with blue trim. A circular insignia is the focal point of a star and is decorated by stars and ribbon. The trophy can be made suitable to any award occasion by personalising the logo insert and the engraving text plate. 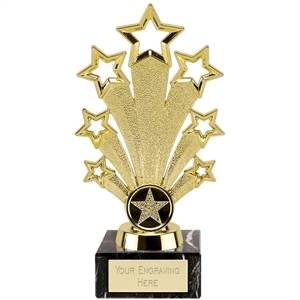 The High Star Gold Award is made suitable for any award occasion by personalising the engraving text plate and including a logo insert. An attractive gleaming golden star stands on a black moulded base with groove detailing. The trophy is made from a high grade plastic and coated with a glossy golden varnish. 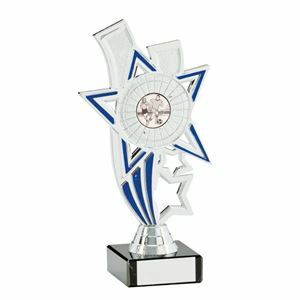 This stylish trophy features a glossy silver star which stands on a black moulded base with groove detailing. The High Star Silver Award is made from a superior quality plastic and lacquered with a shiny protective glaze. This trophy can be personalised to suit any award requirements. 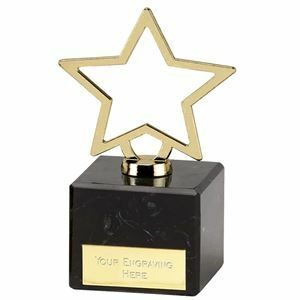 Made from high quality glazed resin, the Pinnacle Star Trophy is a bronze coloured trophy with a gold centre. 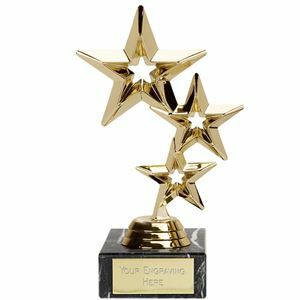 Available in 4 sizes this versatile star award is set upon a trapezium shaped base and can be personalised to suit any award. 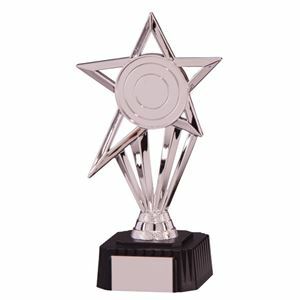 The tall Triple Star Trophy is a high quality plastic trophy available in a choice of gold or silver. 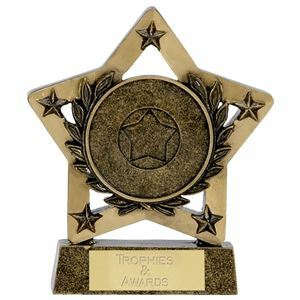 Set upon a black marble base, the Triple Star Trophy features 3 stars stacked above each other and can be personalised to suit any event using a engraved text plate.